Sama is a 21-year-old refugee, who works 12 hours a day, six days a week in three different cafés in Liverpool. She speaks five languages. In her twenty one years she has lived and seen things that most people will never experience in their lifetime. Sama has already mingled the scouse accent with her Syrian tongue; she even dresses like the young scouse girls. She laughs a lot when she talks, even when she describes shocking things. She radiates warmth and friendliness. 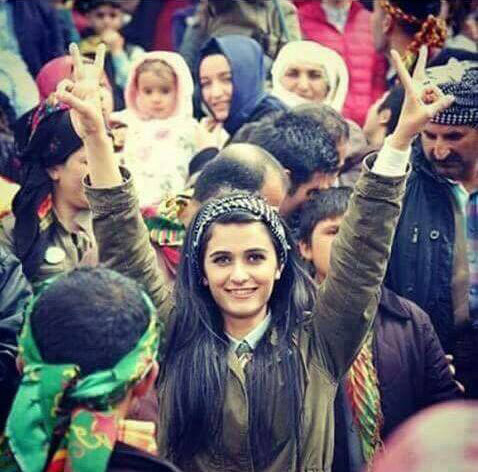 Sama is very proud of both the strength and the humanity of her people: the Kurdish people. She trained in the Women’s Protection Unit (YPJ) but as the oldest member of a family of four girls, was sent away at the beginning of the war against Islamic state (ISIS) because her parents felt she could serve her family and people better. Her best friend was beheaded by ISIS; her 17-year-old sister was also shot in the face by them. Her three sisters are part of the YPJ, fighting against injustice and inequality within their own culture, Syria, but more furiously against ISIS. “I am from Kobane: a city in Northern Syria, on the Turkish border. I am Kurdish. I was in the first year at university, studying English and when the war started in Syria, I left uni and planned to go and fight for the Kurdish people. My mother was very ill at the time and my father was afraid I might get killed. 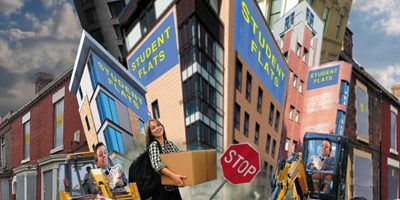 So they insisted I leave; my father suggested I go to the UK and study and work and support my family. It was a very painful thing for me to leave my family in a situation like this. I was so afraid for them, but my parents insisted I was the best person to leave (the oldest). So I escaped from Syria over the Turkish border. I suppose I became illegal at that point. Over the coming months I made my way up through towns and villages, until eventually I arrived in Istanbul, where I stayed with a friend of my father’s for two months. I then paid a trafficker who arranged for me and 22 others (mainly children) to take a very scary boat journey to Athens. I stayed in Athens for one month before I boarded a plane to the UK. The whole journey from when I left Syria to when I arrived in the UK took one year. When I arrived I claimed asylum as a Kurdish person from Syria. They sent me to a hostel in Leeds, where they had guards and I couldn’t leave. They said I would be there for two days. I was there for a month, then they brought me in for ‘the big asylum interview’. I was then told I could claim as a refugee. The week I arrived in the UK, ISIS attacked my town of Kobane. Can you imagine how I felt? It had taken me one year to get here, and the week I arrived my family, friends and my people were under attack. I wanted to go back to be with my family and fight ISIS. But I couldn’t leave. Before ISIS attacked Kobane, the Kobane and the Rojava region had become a very peaceful place. During the start of the Syrian war against the Assad regime, we Kurds used the opportunity to set up our own system of government. We took control of the area we lived in and established our own system of stateless government: democratic federalism; one we had been discussing a long time. The war had given us the opportunity to rule over 300 villages, towns and cities. We began to involve thousands of people in democracy and running their own areas. We spread values such as caring and respect for each other, regardless of religion or race – Arab, Christian etc. – and the equality of women. We believed that you cannot have a revolutionary society unless the women play a role that is equal to men. Recently in Rojava they introduced equality for LGBT people, which is a big thing in the Middle East. But we also understood we would have to protect our area, so we established the People Protection Units (YPG/YPJ) which is a volunteer people’s army, run by the people and funded by the people. We have no police force, and intend to keep it that way. 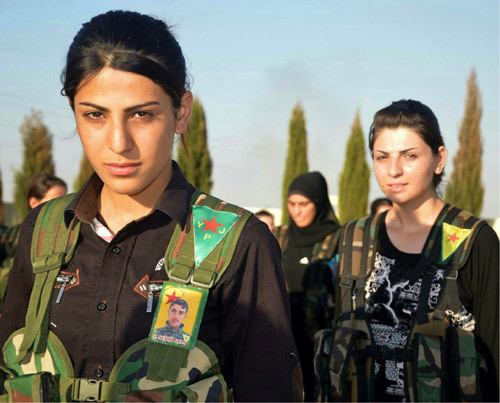 Tell me about your sisters who are fighting ISIS? “I have three sisters who are in the people protection units. They are Narin – she is 15, Shirin – now 17 and Jiyan – she is 18. 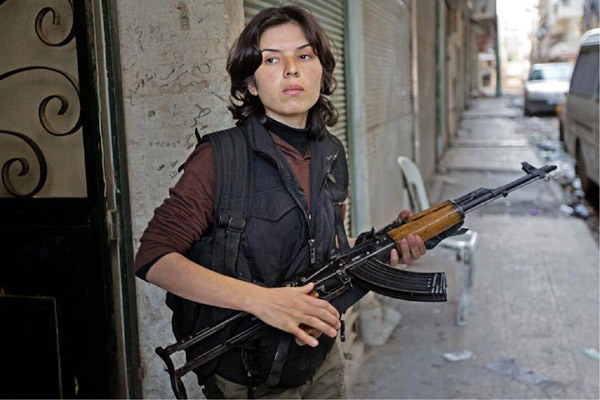 Narin is a nurse and Shirin and Jiyan are fighters in the YPJ. 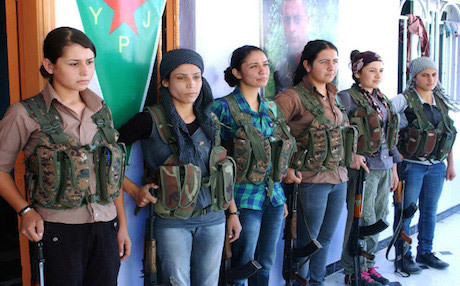 The YPJ role is to educate women; teach them to think independently; make them realize, if they don’t already, their own strength, and teach them how to defend themselves. Narin was working as a nurse just over the Turkish border, helping people who were getting injured by ISIS. She was arrested by the police, thrown in a cell; then these policemen beat her about the face and body. They swore at her a lot (which is a big thing in our culture) and said terrible things to her. After three days they released her and forced her back over to the Syrian side. Shirin was only 14 when she started fighting? Some people here would think that was strange? I suppose in a situation like this you either fight or you die? Getting back to how life was after the revolution and before ISIS attacked, tell me about this? “Well everyone had their part to play; there were lots of things to do. We were taught to care for each other; we were all getting a form of military training too, to look after each other. Everyone was getting taught to have a good conscience, lots of education, lots of discussion, and talks – it was so good. That’s why ISIS didn’t like it. It was so perfect: everyone had a role to play; there was equality between people. Did your dad suffer because of his politics? What happened at the cell of the prison? So I read on the Internet, because they don’t report it on the news, about the recent ISIS attacks on Kobane when they went from house to house, killing 250 civilians? Let me tell you about a friend of mine. She was so strong – a really amazing person – and she said to me before I left, ‘Do you want to join the YPJ and fight ISIS? But as I said earlier my mother wouldn’t let me. When ISIS entered Kobane she joined YPJ and she was fighting and in one fight she got caught by ISIS. They tortured then killed her – they cut her head off. She was 18 and within two days all her family got killed by ISIS. I find it very difficult to talk about this. I am 21 and already a lot of my friends my age, or younger than me, have died. But I have no time to mourn, I just have to say, ‘They died,’ and that’s it. I can’t really talk about this; it’s inside my heart; what can I say? Yesterday when we were thinking about ISIS coming into Kobane again, my friends around me were crying. I was singing and laughing; what can I do? So many people I know have died; what can I say about this? They died. That’s it. I have to be alive. ISIS are killing people in such a ruthless and cold manner. It’s one thing to kill a fighter: a soldier face-to-face but these people are killing children and killing women and unarmed people. This is so terrible. I saw a picture of a child they shot five times. I mean, when you see these things you just want to kill the people who do these things. You are so angry, but you have to be careful you don’t lose your humanity; it’s so easy when you see these things that you can lose your humanity.